Depending on your departure city in the United States, airlines that service the Cancun Airport include Aeromexico, Continental, American Airlines, Northwest, American Transair, Mexicana, and Lacsa. The 1-800 phone numbers and web links for these airlines are available at this magazines Airlines page. The major car rental agencies that service the Cancun Airport are Avis, Budget, Hertz, and National. The 1-800 phone numbers and Web links are listed in this magazines Autos page. Also note that air service is available to the island of Cozumel, just off the Caribbean coast, with ferry service to the mainland. The beach-side resorts along the quieter section of the Cancun-Tulum corridor are all within a 1-2 hour drive south from the Cancun airport. There are a variety of hotels, bungalows, and condos available in the resort areas of Playa del Carmen, Akumal and nearby areas. Frommer's Cancun, Cozumel, Yucatan Peninsula provides information on a broad selection, with ratings for a number of the establishments. Fodors also includes information on attractions and restaurants. 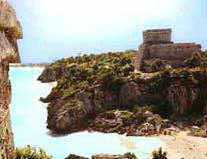 Also included is historical and site information for Tulum, Coba, and other ancient Mayan sites. This and other books on the Yucatan peninsula are available in the Travel Bookstore. The vast Yucatan peninsula (43,000 square miles) is unique in all of Mexico for its independent Mayans, its history, and the beautiful Caribbean coast. The corridor between Cancun and Tulum still provides an abundance of secluded beaches and lagoons. The Sian Kaan Biosphere Reserve just south of Tulum protects the areas abundant wildlife. The best time to vacation along the coast is November to March, when the average high temperatures are in the range of 82-89 F. The rainy season is May-October. Mayan Riviera: Hotels, dining, tours, diving, etc. 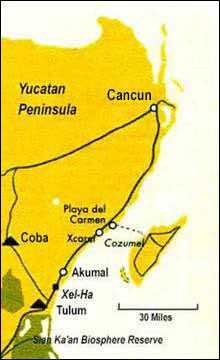 Caribbean Fantasy: reservations for the Mexican Caribbean resort of Akumal and surrounding area. Club Akumal Caribe: one of the main resort properties in Akumal.